I have a new horsetail plant growing in a container in my bathroom. It was looking good with new growing but recently is has started turning yellow and dying. From what I have read they are suppose to be very easy to grow and can grow in low light. Any ideas? Also, are horsetails toxic to cats? Occasionally my cat has been nibbling on them. Sunset recommends "full sun or partial shade" for horsetail (Equisetum hyemale). It doesn't sound like a "low light" plant to me. Sunset also recommends "locate in marshy area or pool." So it likes wet feet but wants lots of sun. Hmmm. Sounds like you've read some conflicting information...people with whom I share a back-yard property line have some horsetail IN THE GROUND near their driveway. When I walk the dogs around this block, I see some very happy horsetail, expanding away up and down their driveway. It gets western afternoon sun but is near some gladioli which the neighbors keep very wet, so the horsetail is very happy, dark green, and spreading. Keep it in a container: Sunset characterizes horsetail as "extremely invasive and difficult to get rid of." Thanks for the info. I have them in an extra dish of water but maybe I need a bigger dish of water. I'll move them to more sun light also. They looked so good in my bathroom so I guess I will have to find another "bathroom" plant. Are you really talking about Horsetail (Equisetum spp. ...because Ponytail palm was what I thought of when you said a bathroom plant in low light. If you're talking about the Ponytail palm a.k.a. Elephants foot palm, I think they were discussing this plant over in the Bonsai forum recently. 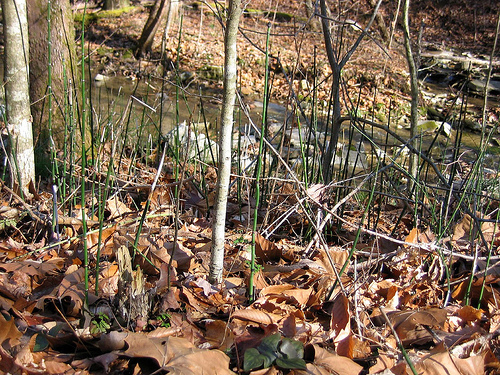 Horsetail (E. hyemale) has no leaves to speak of. It's just stems. The water-color illo in Sunset is a perfect rendition of what my neighbors have. I'll try to find a photo on the web of the same plant; I don't have a digital camera to shoot their plant with and then show it here. I was talking about "Equisetum hyemale" - I actually just read one website that they one need to be watered once a week and can be drought tolerant - I guess that means mine need more light! Equisetum hyemale do like good light -- I've had mine several years now, and I keep them outside in warm weather and near a window as best I can in winter. Don't believe what you read about watering weekly, though -- they do best really wet. I keep mine with about an inch of water standing in the pot (I have them in a pot without a drain). I don't really sweat over the standing water, but I do check on them every morning when I go out on the porch with my coffee and water whenever they're not in standing water (which is usually, unless it's been raining). In the winter, with less light and cooler temps, they can stand a lot drier conditions, and mine have always come back fine from some fairly severe benign neglect in winter -- including a lot of yellowing. Oh, and I've never noticed any harm to cats, though I have noticed that cats like to chew them! Dead, dry stalks have attracted my cats more than healthy ones (crunchier? ), so maybe if you can get your plant happy again it'll solve both problems. I'm most familiar with the field horsetails that I pictured above. When I was little, my friends and I played this game in which one person would gently dislocate a horsetail segment and put it back together, then everyone else would try to guess where the broken place was. Glad to have found this post. I have always wanted to grow these horsetail plants (Equisetum hyemale) because I think they are easy to maintain and i like how they look. Do I have to repot and change the soil from how I originally bought them? Could they also be just in water (like in a vase)? nasturtium leaves turning yellow - help!